Echo is a company that has been in the business of making hand-held outdoor equipment that is professional-quality. More than 6,600 independent dealers across North America sell Echo products, including the GT-225 weed whacker. This is a company that is dedicated to creating quality, professional products for use by the everyday homeowner, as well as for commercial applications. So, you may be wondering why you should choose this trimmer when there are plenty of others out there from bigger brand names, and at comparable prices. Well, we can come up with several reasons why anyone would want to buy this trimmer. It is loaded with great features, such as being lightweight, making it really easy to use. Power - Even though this is a lightweight trimmer, that doesn’t mean that it isn’t powerful. In fact, you can do all of the trimming and edging that needs to be done, without having to worry that your trimmer is going to give out on you half way through the job. Other models may claim to be more powerful, but they don’t have that awesome combination of power and being lightweight. Durability - This is a durable weed whacker that has a sturdy construction. You don’t have to worry about it breaking if you happen to bump into a tree or a rock. Echo knows that there are always going to be obstacles in any yard, and their trimmers, including the GT-225, are built to withstand these obstacles easily. ​Maneuverability - Because this is a lightweight unit, you are going to love the maneuverability. You can get around easily, even if you have to get into tight spaces. It can easily be used in the smallest of spaces, so you can have a great looking yard that is free of weeds and tall grasses, without having to strain yourself. ​Engine - This trimmer has a 21.2cc, 2-cycle engine. It may not be the largest engine when compared with other trimmers on the market, but it is definitely going to do what you need it to do. Another bonus is that the smaller engine makes this trimmer a lot more lightweight than other models. ​Start-up - Starting the Echo GT-225 is easy. Other trimmers take a bit of exertion to get them going. This is not the case with this trimmer. As long as it has gas and oil, you can expect it to start easily every time you need it. ​Maintenance - One of the things that we love the most about this trimmer is how easy it is to maintain. You don’t need to do a whole lot with it, but you can be sure that it is going to be working great for many years to come. If you do have any issues, you can count on great technical support for help. Dual-line exit - No one wants to spend a lot of time working on their lawn. The dual-line exit on this trimmer makes it easy to get the job done in half the time it would normally take. There is also a bump-feed system that works with the dual-line exit. There are all kinds of great features to talk about with the GT-225, but that isn’t to say that there aren’t some things that users aren’t always happy with. We would be remiss if we didn’t tell you the negative aspects. So, let’s look at the pros and cons to consider before buying this trimmer. Debris shield - This trimmer has a plastic debris shield. This means that you aren’t going to end up covered with grass stains. It is still important to wear safety goggles while you are working, as well as boots, preferably steel-toed. Cutting width - You will enjoy being able to get your work done quickly with the 16” cutting swathe. If you cut through heavy weeds, it might slow down a bit, but it will keep on cutting, and it will leave a wide path. ​Ease of use - This is a gas/oil powered machine that requires 89-octane fuel. It starts easily, and there isn’t a lot of smoke to pollute the air and make you choke. It also has anti-vibration technology, which helps make it easier to use; this prevents a lot of soreness later on. Warranty - There is a lifetime warranty on the driveshaft, as well as a 5-year consumer warranty on the entire machine. This is a much better warranty than you will find on trimmers from other big-name brands. There are support services, including service centers, telephone and email support, and an online manual. Attachments - Many trimmers come with a lot of attachments that let you do a variety of jobs around your yard and garden. This is a bare-bones trimmer, so you won’t get those attachments. But, if all you are looking for is a great trimmer, this is exactly what you are going to get. 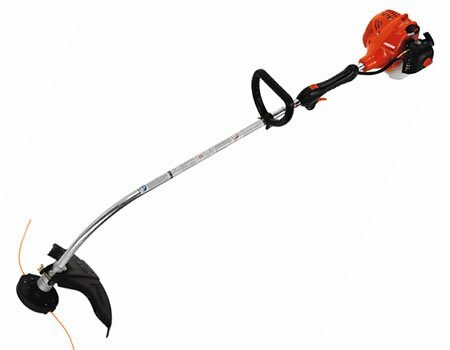 If you like the convenience of a gas-powered weed trimmer, and you want one that is lightweight and easy to use, the Echo GT-225 is definitely a great option to put on your list of trimmers to check out. It may not be loaded with all the features and accessories of the more expensive models, but it has what it takes to keep your yard looking awesome without putting a lot of work into it.